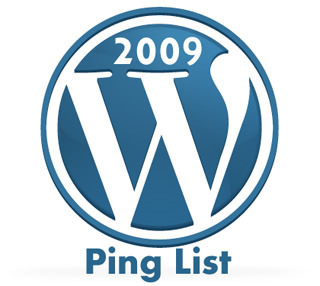 It is recommended to add a list of Ping services to your WordPress Blog. They allow you to automatically notify the blog directories and search engines that your blog has been updated with a new post or article. WordPress comes by default with “rpc.pingomatic.com”. I won’t add that one to the list, so you don’t have duplicated pings. Just go to “settings”, then “Writing” and on the bottom (Update Services) you will find the box to paste this list. Make sure you don’t delete the url that comes by default with WordPress (rpc.pingomatic.com) and you add the following list, just after the “pingomatic” url. This list is updated for year 2009. I don’t recommend having a BIG list… I think that having between 5 and 10 popular ping sites is fine. The problem of having a big list is that every time you post, it takes very long to ping, because the list is large. The other problem with a large list, is that you will probably have small and no popular sites that might go offline soon or late. If these sites go offline, you can have problems when you post. So, below is a list of the most popular ping sites, like I said before, remember to paste these sites after the “pingomatic” url. Blogs, Google, Optimization, Ping, Promotion, Seo, WordPress. Bookmark. Blog and ping should be a vital part of EVERY BLOGGER’S PROMOTIONAL ARSENAL. The pinging process is automated in WordPress, and there are plugins for other blogging platforms. If you find sufficient value in this list of ping services, please link to it in your blogroll. Robert thanks for the link. Having a nice list is always useful, however I don’t recommend adding too many ping sites, just the best ones like I described in the article. Greetings and thanks for posting. I second that, very nice post and information. Thanks for this. It is really imformative read. I enjoy to browse http://www.wpthemesplanet.com. Wp Themes Planet » Ping List for your WordPress Blog great article thank you. Wp Themes Planet � Ping List for your WordPress Blog great article thank you. Thank you, good tip! I delete my long list and now using this one! very good information .. and even beginners dont know how to add. ping list into your blog. so u can also post it. I am not a fan of big ping lists, because of the potential of double pinging and getting banned from the ping services. However, they are becoming very popular these days. I have a new plugin that checks the ping list for duplicate URLs and reports the number of times that they were found on the Spunky Jones SEO Blog. The next version has a ping tester that makes sure the URL is alive. Hello Spunky! Sounds good. I also recommend using a Plugin called “Wp Smart Update Pinger”. With that plugin, you won’t have the problem of double pinging. I currently use, MaxBlogPress Ping Optimizer plugin and works very well for me. I will look at Wp Smart Update Pinger and see what it is about. Thanks for the suggestion. I really enjoyed reading your blog. I’m just getting started with blogging and I didnt realize that having a big ping list would be a bad thing. I assumed, wrongly of course, the more ..the merrier! I’ve now shortened it to your recommendation. Thanks! Thanks so much for the ping list, we will be using it for our blog. Thanks for this small list. I used to use a large list, but found it didnt provide any benefits. Not many ping services actually ping multiple other services themselves, so its possible to use a small list like this and still reap big benefits. Nice list, think ill try it out. Thx. I also read somewhere the danger of having many ping list on WordPress. Thanks for your list, Alex! i always use feedburner for sharing the feeds of my blog, feedburner is really great. This is the correct weblog for everyone who wants to discover about this topic. You understand so much its practically hard to argue with you (not that I in fact would want?-HaHa). You surely put a brand new spin on a subject thats been written about for years. Terrific stuff, just excellent!